Kelly I love the make up but had trouble getting the color right. Now I buy Medium light and classic tan. I use 2 squirts of med light and one or one and half squirts of the tan (depending on winter or summer) and get the perfect color for my skin. for the powder I use 115, I think its classic beige. Matches better than the others. (but classic beige- in the foundation, was not the best color for me. socalmommyof5 This is the best foundation ever! It lives up to its claims and makes aging skin look radiant! It gives my skin a wonderful glow that I have never gotten with any foundation before. It minimizes my wrinkles and lasts all day! I love this product! I wish I could give it ten stars! Lucy I've tried several foundations for the ladies over 50 group and so far, this one is superior to all others for mature skin. I particularly like that in comes in so many shades. It covers evenly and can last for 8-12 hours. It does have a tendency to thicken and I replace it every few months. samintx I've tried several foundations for the ladies over 50 group and so far, this one is superior to all others for mature skin. I particularly like that in comes in so many shades. It covers evenly and can last for 8-12 hours. It does have a tendency to thicken and I replace it every few months. chemist Have used this foundation for I don't remember how many years. 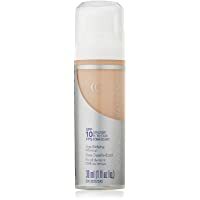 I have really loved this foundation because it covers the redness in my face and looks perfect for most of the day. Since I am outside a lot more now then I ever have been I am changing my thoughts on this product. I normally do get greasy skin t/o the day and while using this product inside it stayed in place and had descent coverage t/o the day. It didn't stop greasiness. Now, that I am outside periodically t/o the day I am not happy w/ this product because I look SUPER greasy and usually by noon. I live in Fl and it is hot and humid but this makeup can't take it. I need to find something else now - sorry cover girl. I have also noticed that my redness starts showing a little after lunch. My skin could be changing and maybe I need a foundation that is meant for greasy skin but never have before so it's on to the next one. What I have loved about this is that it works as a concealer around your eyes depending how you apply it and everyone has asked me what concealer I use around my eyes and I never have - only this! Jan I had been using Chanel makeup but found this just as good and much less expensive. Actually I like it a little better. It is not as heavy and goes on easier. Amber I used to use Bare Minerals, until I discovered that the powdery material was not mixing well with my skin, causing breakouts. I mean BAD breakouts. I switched to MD Formulations cleanser and this makeup. I love that it's moisturizing, and yet my face doesn't feel like an oil slick. I get in my sunscreen with this too since its SPF 10. I have to say that within a month, my skin tone has evened out and stopped breaking out (with the exception of the minor zit here & there; nothing major). I'm only 21 but my skin has been through a lot and this had definitely helped it improve. Highly recommended! Linda I am 58 and have tried tons of foundations from Clinique, Bare Minerals, MAC, on down to this one and I really love everything about it. I also use the cream version of this which is just as great. For anyone in my age bracket, I would suggest trying this because it does what it says. Anonymous I really like this alot.